OSRS account combat level 38 ID#20181122CKJ38 - RuneScape Accounts,RS Accounts,Buying Runescape Accounts,Buying RS Accounts,Cheap Runescape Accounts,Cheap RS Accounts. OSRS account combat level 38 with 1 attack, 70 strength, 1 defense, 41 cooking, 20 firemaking, 30 crafting, 21 theiving, 58 hitpoints. 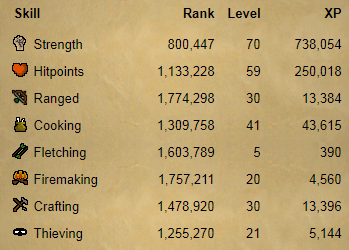 obby pure account , trained by our own gamer ,100% safe to buy.